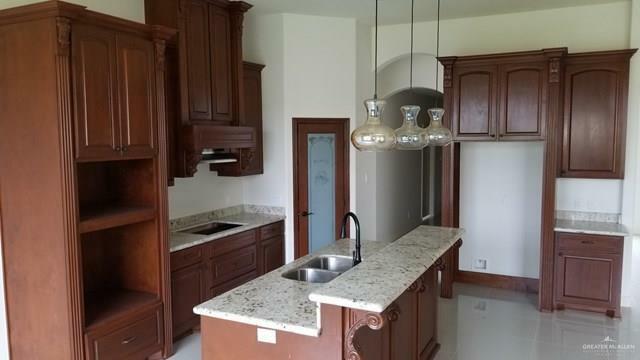 Beautiful NEW construction available in Sharyland ISD!!! Come see this 3 bedroom 2 and a half bath custom home with all its fantastic details. The home features a grand living room with open concept leading to the kitchen with a center island and breakfast area. The large master has plenty of space for your furniture and then some. The master bath has dual vanities, make-up vanity/sitting area, tiled shower with glass doors, private commode and a grand closet with many built in shelves and drawers. All ceramic tile floors, granite counter tops, high decorative ceilings and quality fixtures adorn this fantastic new home. You will find the half bath outside in the back patio area that is perfect for guests as you entertain. Home comes landscaped & ready to move in! Don't pass this one up! Listing by Michael D. Dubert of Davinci Real Estate, Llc.